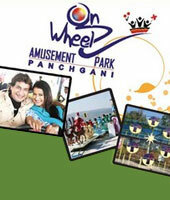 OnWheelz full fledged amusement park located in valleys of Panchgani, Mahableshwar just km from Panchgani main market. 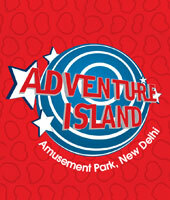 We have rides, indoor games, horror house, pure veg restaurant for all age groups. we cater all visitors from individuals , couples, kids, student groups, corporate outings etc. Treat the whole family to On Wheelz Children Amusement Park during your vacation in Panchgani. This single-day admission ticket gives you access to the many rides and thrills the park has to offer. 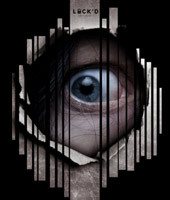 Clue Hunt is a 'Room Escape' game, a clue finder, a mini-theatre and a live action flick at the same time, where you yourself control the course of events. At first sight, it is just another room, but in fact, it is a crime scene full of clues. The goal is simple yet challenging: get out in 60 minutes! Rely on your brains and intuition. Have confidence in yourself and your friends. Discover the secret that awaits you. Do not forget: the mind is the most powerful weapon. Come and Play! "Fly an Airplane -The most amazing experience of your life time". Flying a plane is one of the most desired, but unfulfilled dream that most have. Live your dream in any of our high precision flight simulators. Flight 4 Fantasy is the First and only flight simulation centre in India, providing an experience of virtual flying to non-pilots. 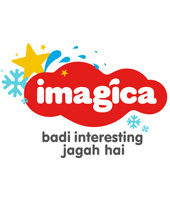 We look forward to welcoming you On Board to India’s most Realistic Entertainment Centre! Welcome to Dreamworld. A dream released on a beautiful 20 acre land dedicated to fun, food, and frolic. A place where there is always something for everyone. Situated at a lush green inspirational locale only 25 km from Lucknow city on the Lucknow-Kanpur highway. Dream world is home to myriad entertainment facilities including India's first Indoor Water Park, Club, Children's park Hi-Tech Video Game Parlour, Amusement Park, Multi-cuisine Restaurants, Party Lawns, Go-Karting and DJ Hall. With such facilities that would easily pamper you, your kids, family members and friends. Dreamworld gives a new meaning to fun and entertainment. Birthday, Anniversary, weekend outing, throwing a party, escaping from the mundane daily life or just relaxing, any reason is a good reason to visit to Dreamworld. Once visit here and you will be convinced that there's very few place quite like Dreamworld. Its so easy to enjoy yourselves here but so hard to forget the experience. 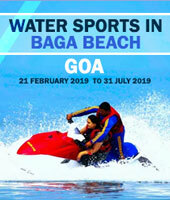 Splashdown is Goa's coolest Water Park. The Facility boasts of 5 pools, a variety of slides, flumes and other interesting features. There is something to do for all ages, the mild and strong of heart. Rediscover the child in you as you hurtle down the slides. 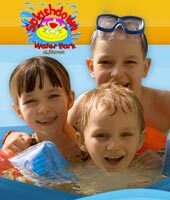 Splashdown's a great place to spend quality time with your family and friends. A unique way to celebrate an occasion, be it a birthday party, family get together or a festival. An awesome place to have a school outing, a college reunion or a corporate meetings. So see you there! 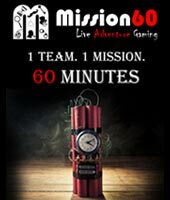 Special Feature- Game room includes a Kid special gaming zone Mission60 makes you Feel Alive by offering Real Life Adventure Games. 2 to 4 players get locked up in a room and get a Mystery to solve. There is just one goal - Win the challenge in 60 minutes. 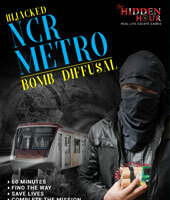 Search for hidden clues, think and solve puzzles and wear the Sherlock hat to win. Once you find a lock, find the combination from the clue and unlock it. Good team work and cooperation is a must! A Casual day in busy Mumbai. The King of Bollywood has been kidnapped you hear the news on radio on your way to your meeting at a coffee house. You over hear a conversation between two suspicious looking people on a table behind you. You and your colleagues jot down an address they happen to be mentioning as Bhai's kholi! You are not sure if this has anything to do with 'the kidnap' but decide to check it out just in case before getting the police involved for nothing. You are locked inside a room and the clock starts ticking. You have exactly 1 Hour, to unravel the mystery and escape. 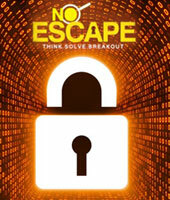 The challenge is to break the code, solve some puzzles and find your way out. 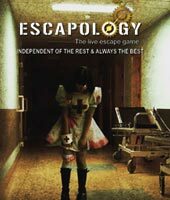 To add to this room escape excitement you also need to achieve a certain objective, depending on the game you chose. But don’t worry, all you really need to do is be observant and keep those thinking caps ON! 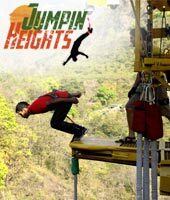 We offer India's highest fixed platform Bungy Jumping (Bungee) at Mohanchatti near Rishikesh. A Cantilever platform built over a iron cliff over looking a rocky river HYUL, a tributory of River Ganga. Jump with rubber cords tied to your ankles and feel the adrenaline rush like never before. Bungee has been designed by David Allardice of New Zealand. Jump Masters flown in from New Zealand to operate the Bungee. 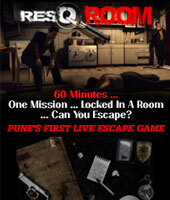 The Hidden Hour is a "Real-Life Escape Game" in Gurgaon, Delhi/NCR where players end up being locked in a room. 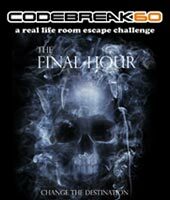 The objective is to accomplish the mission in 60 minutes by finding hidden clues, answering riddles and solving puzzles in rooms full of mystery. If you are an adventure game lover and looking for a thrilling place full of suspense and entertainment, then The Hidden Hour is a perfect place to visit. 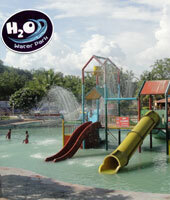 H2O Waterpark is owned and managed by Deogiri Resorts Pvt Ltd. Being the only Waterpark in Marathwada and City of Aurangabad, H2O is aesthetically located in the valley of Daulatabad overlooking the famous Devgiri Fort and enroute to the gateway of the world famous Ellora caves. 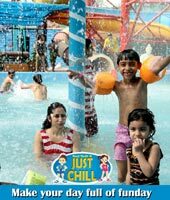 The Waterpark is spread over 14 acres of land and is located 13 kms on the Aurangabad Ellora Tourism Gateway. Set at Daulatabad, H2O Waterpark has thick foliage, palms and coconut grooves. The area has been divided into Metro Walk - the retail experience, Adventure Island - the amusement park and Lagoon - the artificial lake. In metro walk we have showrooms of various brands offering shoes, apparels, eateries etc. On the other hand the amusement park has many unique and ultra modern rides and attractions. The lake offers a beautiful background to Metro Walk and boating facility to Adventure Island visitors. We are proud of the fact that we are the first of our kinds in India and have high regards for customer service, safety of visitors and standards. 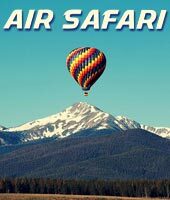 Air Safari (Sky Joy Rides) through paramotoring . One can fly freely in the sky without limits like free bird, and enjoy the mesmerizing bird eye views of land. 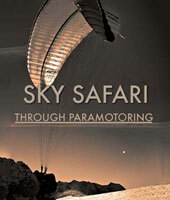 Paramotoring uses a glider and a trike with propeller. It is all the different from Paragliding and parasailing which have limitations for flying, whereas paramotoring doesn't have any limitation. An Ethnic Village Farm. Planned & designed in pure desi style, exquisitely decorated with local art & craft. 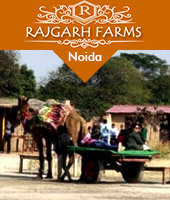 Rajgarh Farms is the perfect place for experiencing genuine rural and cultural heritage. 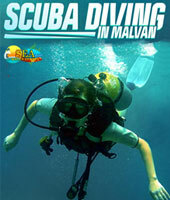 Malvan is a secluded, serene Taluka of the Sindhudurg district, which has something to offer to everybody. No one will return disappointed from this place. 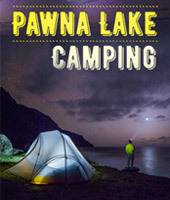 It is the perfect destination to be on, if you are looking for a place to unwind and relax or if you are on a lookout? 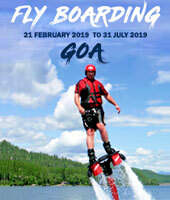 for some thrills to satiate the adventure junkie in you. 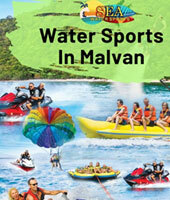 Water activities have been loved as sport, hobby, pastime and many more by adventure lovers. 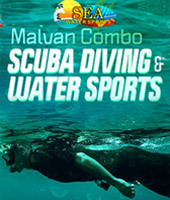 So for those adventures lovers Sea Water Sports brought a combo package of Malvan Watersports and Scuba Diving. Various combo packages with various facilities which are pocket- friendly are available. Consumers can select packages according to their convenience. 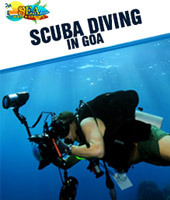 The opportunities of experiencing Scuba Diving as well as various water sports will make your trip memorable for lifetime. 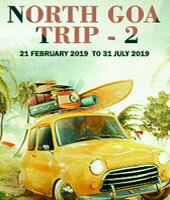 This combo package is now very demanding within tourists in Goa. The majestic cascade of white water, gushing over the steep, nearly vertical face of the mountain from a spectacular height of 1017ft; is both breath taking and awe inspiring, making one aware that there are many forces in nature much more powerful that the human mind and body. The name ‘Dudhsagar’ literally translates to ‘sea of milk’ which many believe is an allusion to the white spray and foam that the great waterfall creates as it cascades into the waters of the lake. 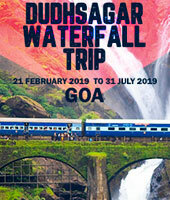 The falls are at their zenith during the monsoon season, although they are a popular attraction all year round. 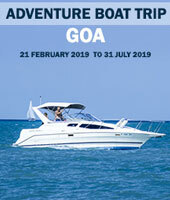 • Goan style buffet lunch at a spice plantation • All entry fees Inclusive. 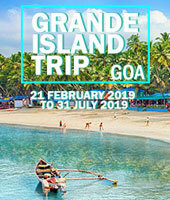 Grande island is famous unique day outing in Goa. The Boat Trip to Grande Island is more than just a boat ride with plenty of fun on the way. If you are lucky, you will spot dolphins twirling in their natural habitat. 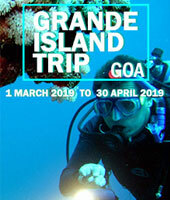 Grand Island Trip Goa Package to the location includes snorkeling, fishing and a scrumptious lunch. 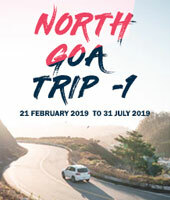 North Goa is the Goa you might have heard all about: crowded beaches, upbeat nightlife, Goan trance, cosmopolitan cuisine, hippie markets and yoga retreats. 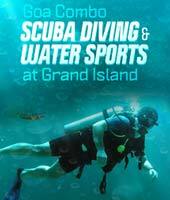 If you like a fast pace and plenty of things to do, this is the place. 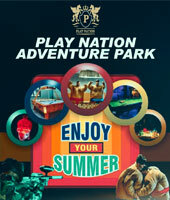 South Gujarat's largest Adventure and Food Park. Largest Trampoline park in Gujarat, High Rope Course, Paintball, Sumo Wrestling, Artificial Wall Climbing Professional Shooting Range, Motion Games, Meltdown and many more international attractions which are nowhere else in the country. It Also houses a multiple Food Outlet Restaurant serving various cuisines All under one roof. 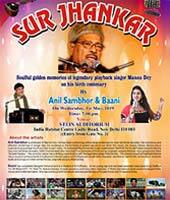 Soulful golden memories of legendary playback singer Manna Dey on his birth centenary By Anil Sambhbr & Baani Anil Sambhor is a follower of Manna Dey. He has been performing before large audiences for over last three decades. His melodious and effective renderings of songs take the audience to the by-lanes of golden period of our Hindi film music.He closely follows Manna Dey's nuances to give proper touch and feel to each song. He is awarded by renowned music organization “SAKHA" forhis dedication towards Manna dey over last three decaded. Delhi Doordarshan also recorded three episodes of Anil's songs originally sung by Manna Dey in programme titled "Sureeli Yaadey".